Serious AMD engineering, but is it too late to the ultra-enthusiast party? Things are getting a tad stagnant in the graphics card market at the moment. Sure, we're still seeing new graphics cards on a fairly regular basis, but they're mostly re-badged, re-released or re-tweaked versions of existing hardware. Whether we're talking about ultra-enthusiast class graphics cards like the Nvidia GTX Titan or lower-end parts like the AMD HD 7790, we're not really seeing new technology - just different ways to package it for the consumer. And here we have another brand new card that we've actually already seen elsewhere in some guise or another. This time it's AMD getting in on the ultra-enthusiast segment, having given its AIB partners a little time in the sun with their own dual-GPU, Tahiti-based cards. "We've helped our partners with these products," said AMD's Devon Nekechuk at a recent briefing. "We actually put a lot of focus helping them develop parts of these cards. We've designed parts of the Ares II and Devil 13 in partnership with Asus and Powercolor. We want to jump in this game, too." 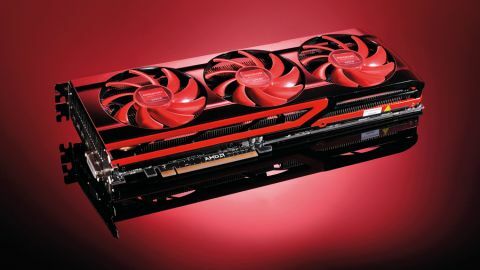 AMD is now releasing its own spin on the CrossFireX card, code-named Malta - the Radeon HD 7990. Yes people, we're talking about a new graphics card, and at £863 (about AU$1,355, US$1,300) it actually costs more than a GTX Titan. "The core of this thing is that we set out to add to the family of the world's fastest graphics card. We wanted to create another product worthy of the HD 7990 brand to make sure we can cater to that market of people who don't buy graphics cards for utilitarian purposes," said Nekechuk. "They really want to create a Ferrari or a Lamborghini of a PC. They have that emotional attachment and they want the ultimate graphics card." So, we're back to manufacturers banging the form-over-function drum, claiming people with the cash for ultra-enthusiast cards aren't necessarily after the outright fastest card, but want the best experience of ownership. This isn't a persuasive argument when it comes to multi-GPU cards. With the vagaries of CrossFireX and SLI, you're almost guaranteed to have to get your hands dirty fixing multi-GPU problems with the latest games at some point, and single cards packing in a pair of GPUs tend to suffer more problems than most.